I know no big deal,,,,a stupid valve cover off of a N20,,,,it was a big deal,,,,we had a lean fuel mixture,,,we first thought we had the typical fuel injectors,,,but spark plugs looked good,,,,we then noticed some oil on top of the valve cover. 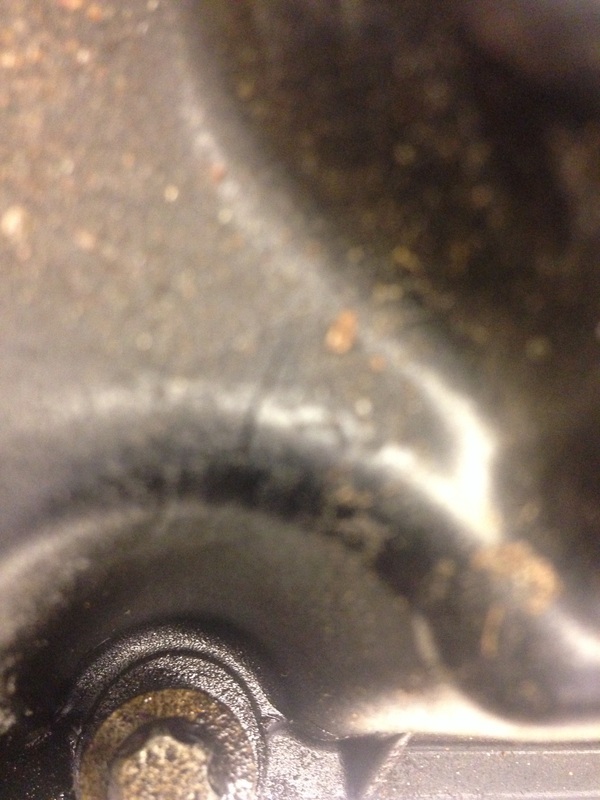 I don’t know if you can see it,,,but there was a hair-line crack in the valve cover,,,thank god for a smoke machine,,,,when we smoke tested the valve cover,,,then when we really found the leak,,,,this is the first time we have seen a N20 valve cover cracked. 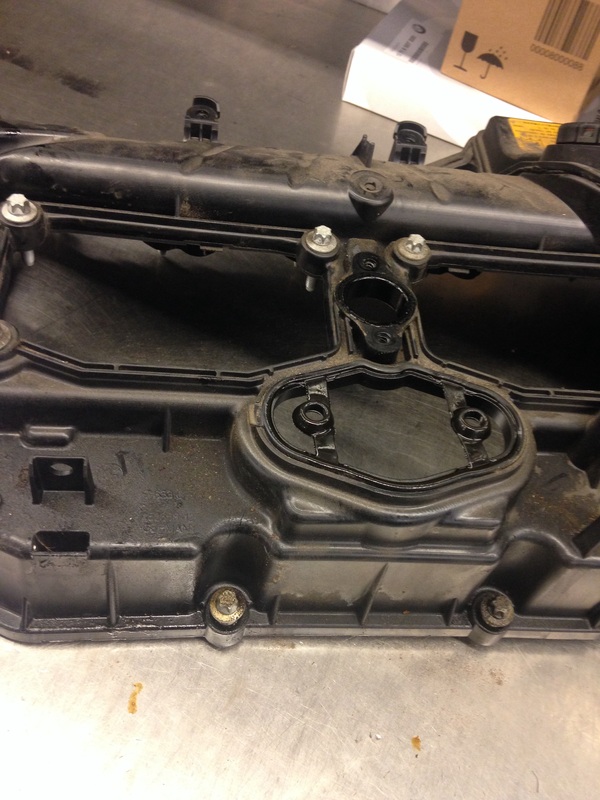 This entry was posted in Uncategorized and tagged cracked, N20, valve cover. Bookmark the permalink. Any hints on how to remove. I seem to be hung up on something near the firewall. I double checked and I have all the bolts out and most of the valve cover is lose and free but seems to still be holding on that end is there a pipe or other device back there that is still connected? That must be it. I did not remove the vacuum pump. Thanks for the tip. It’s tight back there I could not see that well. I was able to remove it by removing both solenoid valves and also the vacuum pump by feeling for the screws it was a size t30 star for the vacuum pump. I replaced the valve cover since I thought that was where the oil leak was coming from (back by the fire wall on the passenger side). Put it all back together and it’s still leaking oil. I am thinking based on location of the oil being above the gasket it’s actually coming out of the vacuum pump itself. There was a small plastic cover on a small valve that seems to have come off. I see some residual oil on it when using a mirror to look back there. I’m guessing oil is leaking past the seals and is being ejected out that exhaust valve. Check the big vacuum line that comes off the pump,,,check inside the line and see if there is any oil in that line,,,,check the vacuum line that go to the left side of the cylinder head for any oil inside the line,,,,if there is any oil in those lines then the vacuum pump is bad,,,,the vacuum pump is bad internally and pumping oil though the lines. There was some oil, also when I took the vacuum pump apart it was full of oil internally. Looks like a bad pump. Sound like it might be bad,,,,on the plastic cover on the engine,,,is there 2 or 1 vacuum port on it,,,,if there is take off the plastic cover again and turn it to see if any oil comes out of the vacuum ports,,,,if oil does come out then the vacuum pump is bad. HI I was wondering if a valve cover leak has anything to do with a oil pan gasket leak. How does the oil pan gasket leak. There is no oil on the ground. Also is there a list of extended service bulletins -example the low emission warranty for 15 years or 150k. Lastly,do you have a list of what components low emission are. Hi I have a e92, n51 328 xi . Valve cover gasket was leaking ,nasty smell from inside the car while heat was on. They said it didnt leak on anything but I still see a ton of oil. Not sure why I see the oil. Just one question: According your experience how long does it takes approximately the replacement of the valve cover gasket in an N20? About 2 hours perhaps? .. More? Less? hi Andreas… again me .. there is still a small oil leak coming from valve cover 😦 … every X kms, a single small drop of oil comes from the gasket of the valve cover and falls over the exhaust manifold producing this disgusting smell to burnt oil for couple of seconds .. I decided that finally i will replace gasket. I read somewhere by the way that for these composite plastic covers, BMW recommends to change cover+gasket. Is this true in your opinion? In fact i was checking the price of the materials, and if you consider that the part number for the cover includes cover, gaskets, all rings, bolts, etc.. (As i could see at least), the price difference is not so big that if you buy all gaskets and rings and joints separately. So in summary, would you recommend to change the whole cover and not only the gasket? Crap. Just discovered a spot on my garage floor. Had the timing chain replaced in May. The tech stated he had some trouble with a gasket and had to drive it home overnight to make sure no leaks. First, can you tell me the typical reasons for a small amount of oil leaking under the car might be, in your experience with the N20? And secondly, how much can I expect to pay at a dealership for a valve cover gasket? If that’s it. 2013 328 with 75k miles. Thanks in advance for any and all information! Thank you! Doesn’t sound like a huge deal then. I’ll keep everyone posted. bmwtechnician, I had taken my car in to the dealer and he suggested I do a spark plug change (car mileage: 50000 miles). 1) Is it absolutely required at this stage, car runs fine, has decent gas mileage and acceleration? 3) There is confusion on the torque setting as well, 17lb-ft or 22lb-ft? usage of anti-seize, electrical grease, swivel/wobble extension to the ratchet. 4) Is there some coding that is required after the job is complete? All in all, $500 for 4 spark plugs at the dealer seems expensive. Waiting to hear from you, thanks. Thank you for your reply bmwtechnician, I appreciate it. I do plan to use the original spark plugs. 1) I have read that the spark plug gap has to be checked even though the plugs for the N20 are already “pre-gapped” this can cause possible misfires. 2) Does the “adaptation” need to be reset and can be done by the user? Do additives need to be added to the fuel tank to let the DME relearn control values for the new plugs?